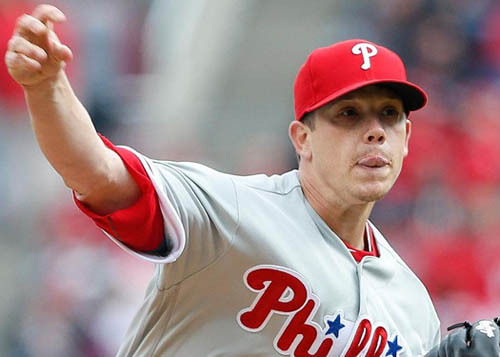 Jeremy Hellickson will never be the type of pitcher that earns headlines for his power or velocity, but he showed again on Thursday why he is so effective, limiting the Marlins to one run over six innings in a Phillies 3-2 win at Citizens Bank Park. "Sometimes when I watch him pitch - when he's doing it right, he looks like he's just playing catch with the catcher," said Phillies manager Pete Mackanin. "The catcher puts down a location and he throws it there, it looks just like a game of catch." Hellickson relied on a change-up that has proven to be effective and kept the ball down in the zone, leaving just one of his 94 pitches on the afternoon in the top third of the zone. He found himself in trouble in the fourth after surrendering back-to-back singles to open the frame, but escaped by getting Giancarlo Stanton to chase a change-up low in the zone and inducing a line-out and fly-out. "The change-up is my go to pitch against everybody," Hellickson said. "I'm just locating it well right now.I'm just trying to stay down in the zone and get weak contact." The Phillies jumped ahead early with Daniel Nava opening the contest with a walk and eventually scoring an Odubel Herrera ground-out. Freddy Galvis then scored in the third, batting a triple down the right field corner and coming across home on a Herrera grounder to second. Brock Stassi knocked in what became the winning-run in the sixth with an RBI triple, scoring Michael Saunders who reached earlier in the frame on a single. The win sealed a series sweep for the Phillies and extended their win streak to six, a mark last hit in late April 2016. The momentum is important, considering the club opens a series Friday in Los Angeles against the Dodgers and then travels to Chicago for a series with the defending champion Cubs. "When we looked at the schedule and saw who we were playing in the first two weeks we knew we had our work cut out for us," Mackanin said. "We've handled it very well and now we have two good teams we're going to be facing, so we're going to continue doing what we're doing and hope for the best." Thursday's win marked the first the Phillies have won six straight games against NL East opponents since they won seven straight from July 5 to August 1, 2015. Taking it a step further, the win marked the first time Philadelphia has completed consecutive sweeps against divisional opponents since September 12 to 20, 2012. Philadelphia's starters have allowed three earned runs or fewer in 10 of their last 11 starts. In those starts the staff has compiled a 3.17 ERA and help opponents to a .219 batting average. The Phillies hold sole possession of second place in the NL East and travel to Los Angeles with a run differential of plus 11.